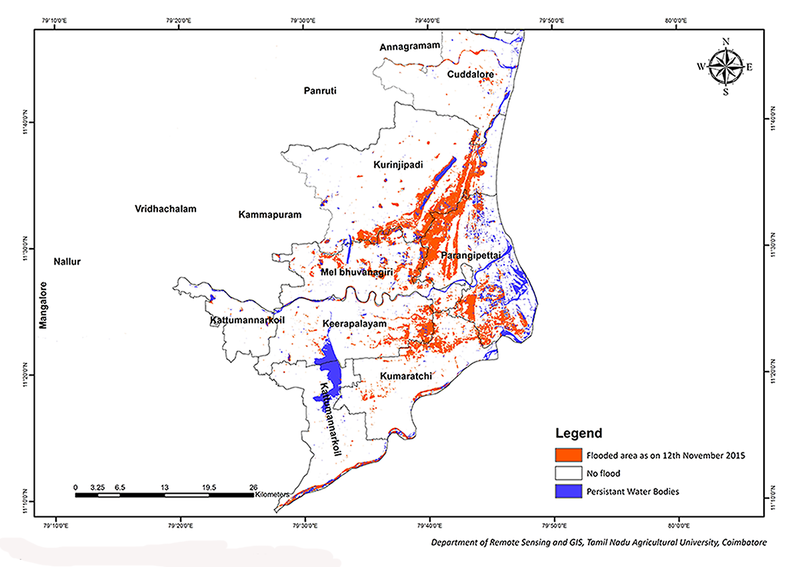 The State Government of Tamil Nadu, India initiated several policy level measures in alleviating the losses in the aftermath of the 2015 devastating floods based on a timely assessment report containing flood maps and statistics provided by the ‘Remote Sensing-based Information and Insurance for Crops in Emerging Economies’ (RIICE) project. RIICE is a Public-Private Partnership whose aim is to reduce the vulnerability of rice smallholder farmers in low-income countries in Asia and is jointly implemented by the Swiss Development Cooperation, GIZ, IRRI, SARMAP and Allianz Re with Tamil Nadu Agricultural University (TNAU) as its technical partner in India. 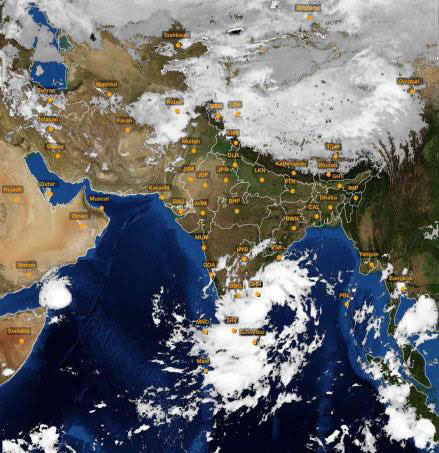 The deadly depression crossing over the Tamil Nadu coast in early November last year (as shown in the left image captured by a meteorological satellite), caused heavy rains and subsequent flooding in many districts of Tamil Nadu and Puducherry resulting in a death toll of 347 lives in addition to severe damage to agricultural land and property. 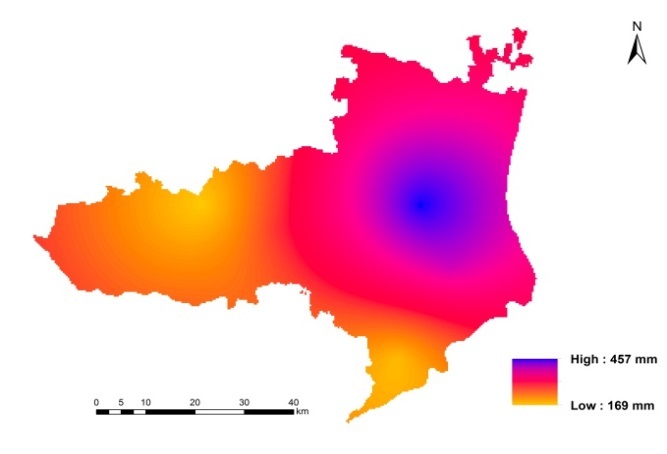 In response to the catastrophe, the RIICE’s flood assessment report was delivered as part of the relief and flood rehabilitation efforts to the Vice-Chancellor of the Tamil Nadu Agricultural University, Coimbatore only a few days after the event (please see the flood map below) . 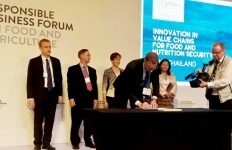 The report was subsequently shared with the Agricultural Production Commissioner and the Chief Secretary to the Government of Tamil Nadu on 13th November 2015. The report initially helped in identifying the flood affected areas and facilitated relief and rehabilitation measures undertaken by the State Government. Dr. M. Bhaskaran, Special Officer (Seeds) and officials from the Agriculture Department highly appreciated the quick delivery and the usefulness of the information provided by the flood assessment report provided by TNAU and RIICE. Speaking at a relief event organised by the district administration he explained that the report was used as the main tool to rapidly decide on provision of relief materials such as input, seeds and seedlings to 400 flood affected farmers in the district. Flood map derived from Sentinel-1A ©Copernicus data (2015). TNAU as a stakeholder in the RIICE project has been monitoring rice crop and estimating yield using satellite data in the Cauvery Delta Region in the state of Tamil Nadu. 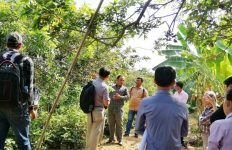 TNAU has been trained by RIICE parties to acquire and locally process high resolution Synthetic Aperture Radar (SAR) data from different space agencies to obtain the rice area maps and to further link the generated data to a specialized crop growth yield model to generate yield maps. During the current cropping season Sentinel 1A data was acquired from the European Space Agency (ESA) and used for crop monitoring. For a continued assessment of the affected areas, monitoring under RIICE is currently underway. Cooperation with the Government of Tamil Nadu is being sought to further develop and operationalise a working model of remote sensing and smartphone technology based crop insurance system to further improve the delivery of agriculture risk solutions in the state. With the latest advances in the domain of remote sensing and crop yield modelling, it is now possible to provide near accurate information on crop acreage, crop health, yield estimation, damages and loss assessment during events like floods and drought. 1. 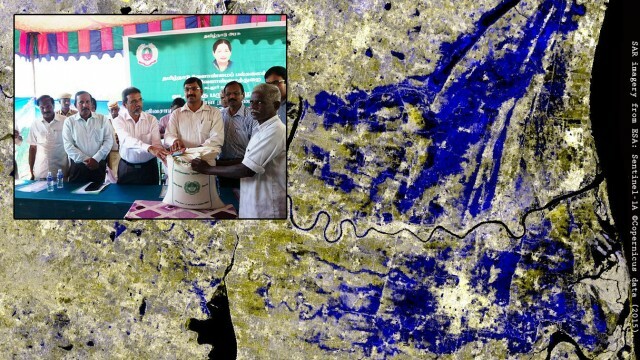 The flood assessment report and its inputs acted as a primary tool for taking policy level decisions to rapidly provide relief materials to flood affected farmers in the affected areas of Cuddalore district. Based on the report about 50 tonnes of paddy seeds of CO 51, a short duration newly released varierty, and 30,000 nos. of Brinjal seedlings were mobilised for distribution among the flood affected farmers to enable rapid replanting. An event was also organised by the district administration at Kalkunam village of Kurinchpadi block of Cuddalore on 21.12.2015. 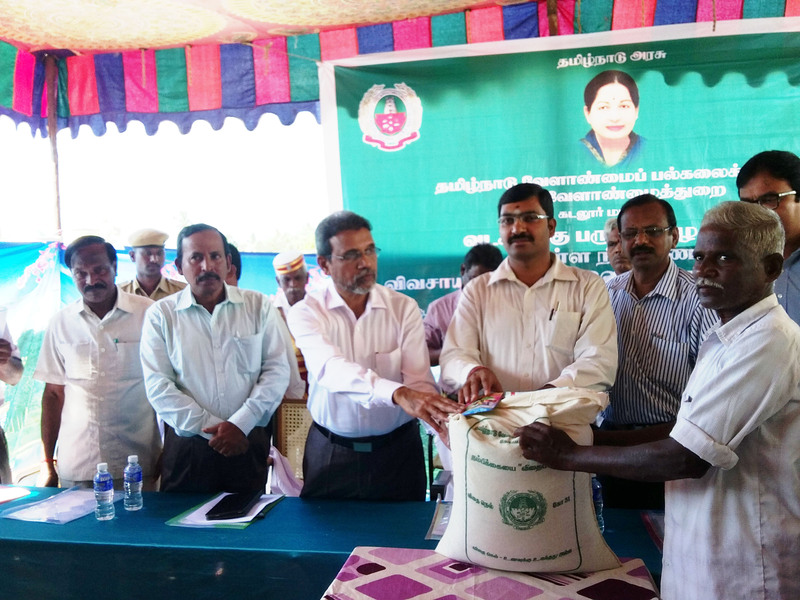 The district Collector, Cuddalore, Government of Tamil Nadu distributed the relief materials to selected farmers in the presence of the Joint Director Agriculture and other department officials. The timely delivery and utilitarian focus of the report was highly appreciated by the present dignitaries. 2. Based on the flood assessment and mapping capabilities demonstrated during the floods in Tamil Nadu, TNAU was nominated as member of the disaster response committee constituted by the state government. 3. Tamil Nadu Rice Research Institute, a research body specialising in rice research, in cooperation with the Department of Agriculture has constituted and deployed teams of scientists to the affected area and suggested use of micronutrients for quick recovery wherever temporary inundation was observed. 4. 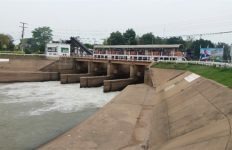 Based on the RIICE flood report a team from the Directorate of Natural Resource Management, the Tamil Nadu Agricultural University has been working on the possible nutrient loss and silt deposition due to the floods besides the improvement in resources across waterbodies in the region. 5. The report on flood affected areas has also been shared with the Directorate of Economics and Statistics, Government of Tamil Nadu. This report will also act as a complementary source of information and the basis for distributing relief funds amongst the farmers.